Jerri-Lynn here: The following DeSmogBlog post is one of many articles published this week detailing how closely fossil fuel interests worked with newly-sworn in Environmental Protection Agency (EPA) administrator Scott Pruitt, during his previous tenure as Oklahoma Attorney General, to thwart climate change policies. The articles were sparked by the release of more than 7,500 of Pruitt’s emails, following a court order. As Oklahoma attorney general, Mr. Pruitt was part of a coalition of about two dozen mostly Republican state attorneys general who sued the federal government over an array of regulations during Mr. Obama’s presidency, targeting numerous environmental rules. Mr. Pruitt often joined lawsuits with energy companies that also contributed to his campaigns for the attorney general post. The Center for Media and Democracy (CMD) has published thousands of emails obtained from the office of former Oklahoma Attorney General, Scott Pruitt, who was recently sworn in as the head of the U.S. Environmental Protection Agency (EPA) for the Trump Administration. Housed online in searchable form by CMD, the emails cover Pruitt’s time spent as the Sooner State’s lead legal advocate, and in particular show a “close and friendly relationship between Scott Pruitt’s office and the fossil fuel industry,” CMD said in a press release. CMD was forced to go to court in Oklahoma to secure the release of the emails, which had sat in a queue for two years after the organization had filed an open records request. Among other things, the emails show extensive communication with hydraulic fracturing (“fracking”) giant Devon Energy, with Pruitt’s office not only involved in discussions with Devon about energy-related issues like proposed U.S. Bureau of Land Management fracking rules, but also more tangential matters like how a proposed airline merger might affect Devon’s international travel costs. They also show a close relationship with groups such as the Koch Industries-funded Americans for Prosperity and the Oklahoma Public Policy Council, the latter a member of the influential conservative State Policy Network (SPN). 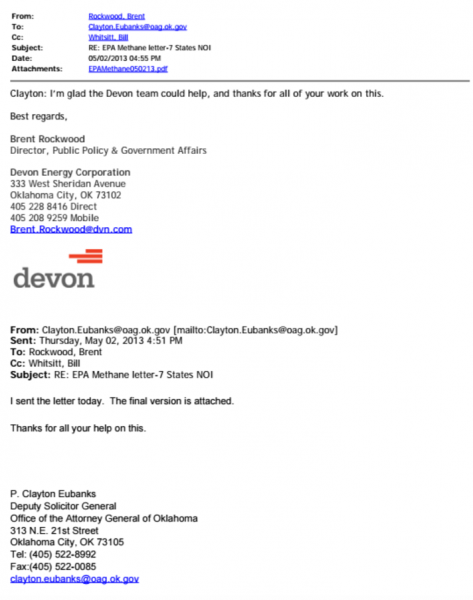 On the BLM fracking rule, Priutt’s office solicited input from Devon, the Oklahoma City fracking company, which seemed to incorporate the feedback in the company’s formal legal response. Pruitt’s office was aiming to sue the BLM on the proposed rules, a case multiple states eventually won, getting indispensible aid in the effort from the Interstate Oil and Gas Compact Commission (IOGCC). This batch of emails was not among those published by the New York Times as a part of its investigation into the correspondence Pruitt and other Republican state-level Attorneys General had with energy companies, which revealed that Devon had ghostwritten letters which Pruitt’s office sent to federal officials and agencies. It does not appear Pruitt’s office ever wrote the article, however. 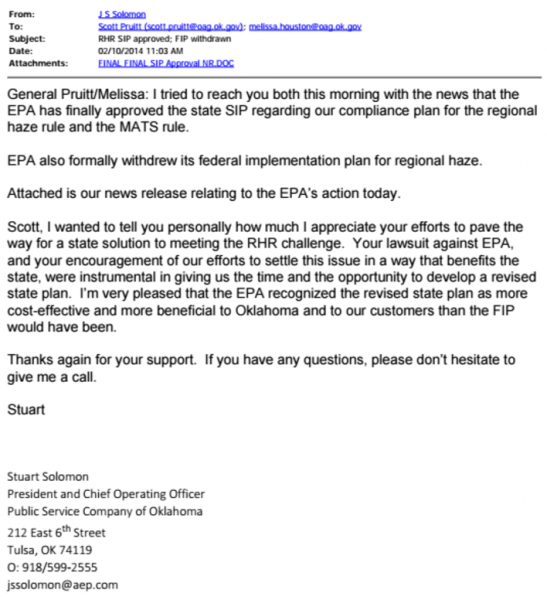 But that same month, Stuart Solomon, President of Public Service Company of Oklahoma (a subsidiary of American Electric Power), thanked Pruitt “personally” in a February 2014 email for its help fending off the EPA’s proposed regional haze rule. Pruitt and his office were not thanked within the press release. In July 2016, the U.S. Court of Appeals issued a stay on that rule and it was never promulgated. The emails also shed new light on the relationship between Pruitt and the sphere of advocacy outfits and legal groups funded by Koch Industries’ billionaires Charles and David Koch. For example, Pruitt and many other Attorneys General — plus industry actors at companies such as Southern Company, ConocoPhillips, Chesapeake Energy, TransCanada, Devon Energy, Marathon Oil and others — received an invitation (see page 560) to an event hosted by George Mason University, the Koch-funded libertarian bastion, at its Mason Attorneys General Education Program. That invite came from Henry Butler, Dean of the George Mason University School of Law. Harold Hamm, President Donald Trump’s campaign energy adviser, was also included on the list of those invited, as well. An email attachment of the invite was not included in the batch. Beyond George Mason, the emails also show Pruitt’s office maintained communications (see page 683) with Americans for Prosperity Oklahoma State Director, John Tidwell, as well as with SPN member Oklahoma Public Policy Council. SPN receives Koch money. These are some of the highlights found within the massive batch of emails. CMD argues, as the Democratic Party’s Senate leadership posited, that these emails would have been useful in doing their constitutional “advise and consent” confirmation process work for Pruitt. 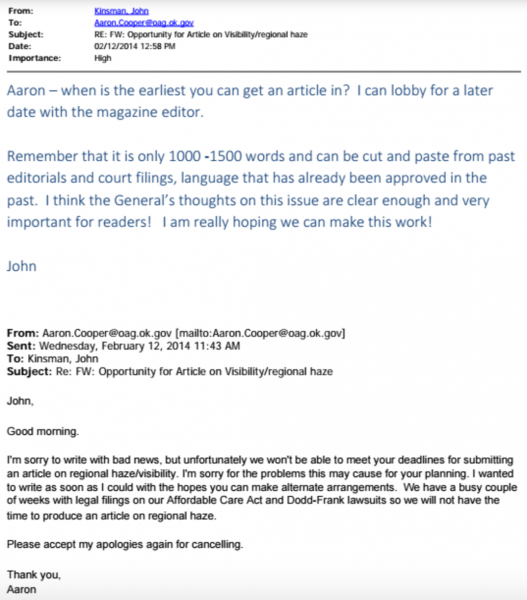 This entry was posted in Banana republic, Environment, Global warming, Guest Post, Regulations and regulators on February 24, 2017 by Jerri-Lynn Scofield. Would it have made any difference? Seems like this is exactly what the Rebulican’s want and some Democrats for that matter, and judging by their town halls they really don’t care about their constituents, just their pay masters. Though it may have made it harder for some of them to vote for him and made the confirmation more difficult. Looks like standard operating procedure for Banana Republics. I feel the same way. I know the people at CMD and it is great that they did this. And they are right that this info should have been available for his confirmation. But the notion that this would have made any difference I find hard to believe. Devos was absolutely and clearly connected with virtually all of the same players (controlling for industry) and it made no difference in her case. Nor, I predict, will there be a single R senator who chimes in about how troubled s/he is by these close industry connections. The liberal non-profits still have clearly not figured out what hit them. As far as I can tell, there has been no change in how they do (non-profit!!) business since Trump has come on the scene. “…..and judging by their town halls they really don’t care about their constituents, just their pay masters. Though it may have made it harder for some of them to vote for him and made the confirmation more difficult. Nothing more needs to be said……. We’ll never know. But I suspect that Mitch McConnell feared it might make a difference. It’s possible that there were a few Republican senators who told him that if the emails were revealed to be sufficiently embarrassing, they would either have to vote against Pruitt or abstain. That’s pure speculation on my part. But really, why else would McConnell have rammed the vote through the Senate so quickly? What if you have a bunch of emails from wind, solar and hydro companies with a state attorney general advising on the structure of renewable portfolio standards sure to boost the cost of electricity, impacting low income people particularly hard? 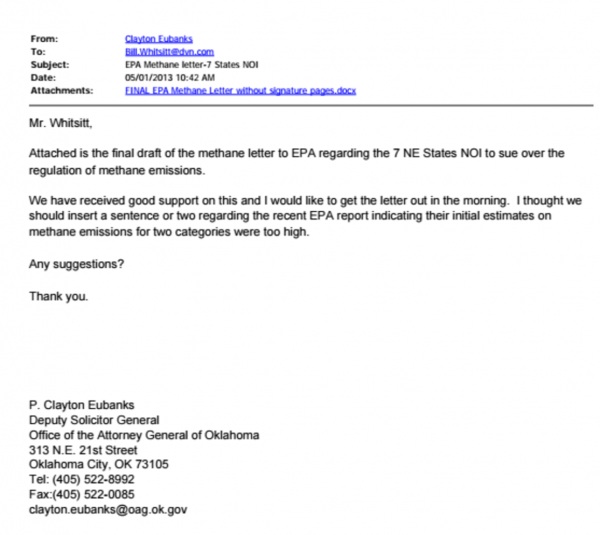 Craazyman, some of those email messages are about ways that Oklahoma could circumvent the law. If they were technical energy or environmental issues, the Attorney General’s office should not have been involved. It would have been more appropriate for the Department of Environmental Quality or the Oklahoma Corporation Commission to participate in the types of communications to which you refer. But some of the email messages seem to be inappropriate for any of those government agencies. The Oklahoma agencies seem to be completely captured by the industries that they are supposed to regulate. Aside from all of this, why should the Oklahoma Attorney General be the one who sues the US EPA at the expense of the Oklahoma taxpayers? Shouldn’t corporations doing business in Oklahoma be the ones to sue? He’s an elected official. So by definition he’s representing the people of the state in his capacity — whether poorly or well is a separate matter and a personal opinion. It’s not surprising that a politician would take policy positions they believe reflect the economic interests of their constituents. Attorneys general act as advocates for state voter interests in the area of utility regulation all the time, all over the country. Probably other energy areas too. One may disagree with a state’s electorate in their policy choices, but they have their right to choose and vote for an AG who they believe will represent them. Enoough already with the Koch Brothers Booogie Men. It’s a rhetorical dead end. Take a look at Dark Money: The Hidden History of the Billionaires Behind the Rise of the Radical Right, by Jane Mayer. Unlike imaginary boogie men hiding in the closet or under the bed, the Kochs are real, they’re ultra-rich, and they are causing massive harm all over the country. It means that energy (no pun intended) spent on ad-hominem Boogie Man fussilads of narrative napalm distracts from arguments over where it’s best that energy come from and what compromises are tolerable. People turn off when they see mudslinging and ad hominem invective. There’s so many positive reasons to be in favor of clean, green power. And let’s face it, if people want to drive cars and have electricity — society needs natural gas, it needs pipelines, it needs oil, it needs these things. At what point does a compromise turn into poor policy — well, that’s democracy for you. 1. Criticizing bad policies of Scott Pruitt, Donald Trump, or David Koch is not ad hominem argumentation. There’s a point where a person has done so many bad actions, or advocated so many bad ideas, that his name becomes a shorthand for those actions or ideas. 2. But maybe we should engage in ad hominem argumentation, since Donald Trump, Rush Limbaugh, Ann Coulter, and a host of right wing columnists and politicians have been doing so with great success for decades. It’s sad, but millions of people respond favorably to ad hominem invective. I can’t stand them either. Years ago I listened to Rush Limbaugh just to hear what he was all about. He (and this goes back a looong time), he was very articulate, very silver–tounged, at times he was entertaining. But I just turned off quick to the ad-hominem bullying. Same thing with Sean Hannity, another very talented guy who would go into demon-mode at the drop of some politican’s name and his face would turn into something you’d see on Halloween. And there were others, on the right. You can tell they’re just flaming up their audience. You are right, millions respond to it. That depresses me, when I think about it. But I believe even they, those who respond to it, would also respond more enduringly and lastingly to higher-minded narratives. Bernie’s success in the campaign (and I gave him $300) is proof in my view. Not just in my view, of course. It’s been widely noted. On balance, I’m not convinced earlier disclosure of these emails would have made much of a difference, sad as that is to say. Yet especially given how hard it was to get these emails released, I think they should be as widely circulated as possible, and read. If any State AG in Australia had those sort of connections and conversations to industry, they’d be jailed. It’s called corruption, or not really doing ones’ job. Not shocked, just surprised that the relationships are not done in secret. A new Govt here, generally leaves the permanent department heads in place (they are usually on contract and supposed to work impartially for any Govt). They are career public servants for the most part. No issue better exemplifies short-termism than fossil fuel consumption & pollution, and short-termism is the bane of our soon-to-be-terminated existence. Craazyman has a theory and Vatch has a theory of what to approach and how to approach it. There are enough people out there ( out here) who want to do something useful that each theory could be pursued by a group of people who like that theory best and believe in it most. I myself believe either theory can be more useful at certain times and places and under certain circumstances. There is a time to use either or both. For example, talking up all the nice clean-energy things we could have if this, that and the other technology and lifestyle re-arrangement were pursued will inspire people to push for those things. And but also, too, on the other hand; where the Koch Organizations can be shown to be actively trying to deny us from having nice things, such as Koch-driven efforts to apply punitive taxes against rooftop solar electric systems in order to brute-force disincentivize otherwise-willing people from deploying them on their roofs; then it is entirely appropriate to discuss in that instance how the Kochs are spending big money to pre-shape the energy battlespace to keep us from having nice things. Furthermore, since some people are motivated more by hate than by light, pointing out how the Kochs ruin their lives may inspire them to try ruining the Kochs’s lives right back. Which coal and oil companies are Koch-owned in particular? How many blue-minded people live in the Dark Shadow of the Kochs’s market reach and power? Would some people be driven to re-arrange their lifestyles as much as feasible to withhold their money from Koch-specific energy companies in their area? Would enough millions of people take that approach to really matter? Picture 50 million pairs of Strong Blue Hands, wrapped around the neck of KochCo, Incorporated. . . . squeezing flat the Kochs’s revenue stream windpipe . . . squeezing, squeezing, squeezing. Picture a Thousand Points of Hate, to paraphrase George 41. With a head full of plans and a heart full of hate, we can make things happen. Meanwhile, for those who prefer light to hate, there are many uplifting publications and websites about alternative energy production and consumption and conservation approaches. I myself have learned some things from these places and my electro-consumption reflects what I have learned. My electric bill last month showed me using 3.4 kilowatt-hours of electricity per day. I believe that is below the per capita average. If I flatter myself without justice or factual basis, I am confident some of my fellow readers will point that out to me. Oklahoma now has moderate and growing numbers of earthquakes and will for the foreseeable future. If Pruitt has his way, all kinds of drilling rights will be granted including off the Atlantic, additional deep water wells in the Gulf of Mexico, and cart blanche to drilling rights on federal lands. Really interesting thing is if the EPA can largely get a number of issues pushed back to down to state-level regulation. Nevermind this is a nonsensical solution to most air and watershed pollution issues. It is the end game given GOP control at so much of the state and local level and at least through 2020. I would have thought Flint would have forced national action but it didn’t. Nobody in the national media really cares about poor blacks having no drinking water in their homes or the thousands of kids ultimately likely to have long-term developmental disabilities because of what happened. We have turned into such a catatonic and insular people it will take a large scale and long-term disaster which can’t be ignored because it effects so many to see any kind of pronounced action. …state-level regulation. Nevermind this is a nonsensical solution to most air and watershed pollution issues. Absolutely! Thank you. Water and air flow across state lines quite rapidly. Such issues must be solved at the national (or even international) level. But in the meantime, since the next 4 years or 8 years will see EPA type authority sent back to the States whether you and I like it or not . . . should Blue people be thinking in parallel about how to defensively regulate in those few jurisdictions where they still have some effective self-governance? And more to the point ( and bigger and better) , should Blue people begin really studying just how and where they use what forms of energy in their daily hourly minute-to-minute lives? And begin re-arranging their lives in order to expunge certain forms and sources of energy from their lives? In order to degrade and attrit their revenue streams from reaching their Existential Enemies? Are Blue people ready to do that? And likewise, the rising tide of deep injection well earthquakes in Oklahoma could have forced national action but it hasn’t. If non-poor white Oklahomans getting earthquakes won’t force national action, why would leaded drinking water for poor blacks in Flint force any national action? The national catatonia may be a result of national despair. The national despair may be induced by 8 years of betrayal by festering Clintonite filth delivering the exact opposite opposite of what they ran on . . . followed by 8 years of degradation under Bush 43 . . . followed by 8 years of betrayal by festering Obamazoid filth delivering the exact opposite of what they ran on. The Clintobusha Administrations lasted for 24 long years of destruction, degradation and decay. That is enough to catatonify a nation of people. Individuals may have to pursue some sort of “effectiveness therapy” whereby they see that they can make a difference in their individual money-lives by conserving this-and-that here-and-there. And then significant numbers of those self-effectivised individuals will have to come together and see if they can launch partial extermination and attrition raids against the economic existence of their Clintobozoform-BushCo enemies through targetted extermicotts and so forth.